Choosing a top quality canned dog food can be difficult. You want to consider your dog’s preferences, but you also need to factor in cost, ingredient quality, company reputation and your dog’s individual health needs. Below top 50 best canned dog food brands were chosen and ranked based on the above factors, including pet owners' reviews and ratings. Dry kibble is the most popular meal dog owners buy for their canine companions. But, it's also the most boring option on the market. Some premium quality kibbles use raw pieces to entice dogs to eat, but the cheaper quality kibbles only offer a bland diet. While dry dog food will meet your dog's nutritional requirements, there's a number of picky eaters that prefer wet dog food instead. There are several benefits of feeding your pooch the best can dog food brands over dry kibble, as pointed out by Dr Jennifer Adolphe, PhD during one of our podcasts. Wet dog food will spice up your pet's diet and could encourage a Fido with low appetite to eat, among other benefits. Price: $48.97/12 cans 13 oz. Starting off the best canned dog food list with some of the lesser known brands, Tripett is mostly found in local pet stores and the company doesn't spend much on advertising, often choosing to invest in higher quality ingredients and better manufacturing process. Made with all-natural tripe, this specific wet dog food recipe is available in beef & venison, beef, beef & duck, bison, and lamb. Containing 100% pure meat, this food has no fillers, no dyes and is perfect for picky eaters. This is a supplementary wet food that is designed to supplement a dry food or raw dog food and should not be fed alone. Price: $32.00/24 cans 5.5 oz. One of the more unknown brands of wet dog food out there, the company often sells this food in local pet stores and has received a lot of praise from pet owners. A number of canned dog food reviews have pointed out this specific formula's ingredient list – made with MSC certified sustainable seafood, this best canned dog food brand made with whitefish and potato flavor contains no corn, no wheat, no soy, and no artificial preservatives/colors/flavors. This is a well balanced wet dog food and is designed to offer our canines the same quality of nutrition that we eat ourselves. Price: $26.11/12 cans 13 oz. This natural and holistic food is approved for feeding to all life stages. Simmered in broth it contains premium ingredients and is available in chicken and rice, chicken/turkey/lamb/fish, lamb and rice, large breed adult formula with duck meal, and senior and overweight formula with chicken. This best canned dog food is made in the USA. Price: $38.85/24 cans 5.8 oz. Royal Canin is often one of the more expensive wet dog food brands, but it's also often the number one vet recommended dog food option out there due to company's dedication to research and manufacturing of health-specific recipes. This particular best canned dog food brand is ideal for older dogs – it has a variety of potent scent and reduced levels of phosphorus to accommodate older dog’s kidney health. This is a complete and balanced wet dog food that provides your pooch with everything they need in a meal including additives for healthy aging support. Price: $18.88/8 cans 3 oz. These grain-free mini entrees are available in eight flavor varieties and are designed to meet the needs of small breed dogs. Made with no meat by-products or fillers each of these entrees contains 3 oz. of food. Perfect for rotation feeding, these small cups are perfect for picky dogs who are easily bored by one flavor of food. Price: $34.99/12 cans 13 oz. Balanced to meet the everyday nutritional needs of dogs of all life stages this food is available in beef, chicken, duck, lamb, turkey & duck, and whitefish/salmon/herring flavor varieties. Made with quality ingredients this is an all-natural food made without corn, soy, wheat, and artificial colors/flavors/preservatives. This food is a made in North America. Price: $24.99/12 cans 13.2 oz. Available in beef, chicken, lamb, and turkey flavors this is a complete and balanced food made with quality ingredients. Made with all-natural ingredients and manufactured in the U.S. this food contains no corn, wheat, meat by-products, or artificial colors/flavors/preservatives. Eagle Pack Natural wet food is approved for dogs of all life stages. 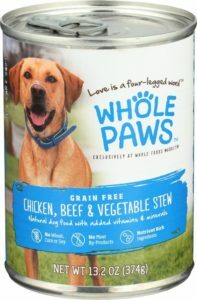 Whole Paws is a food made available from Whole Foods and it contains no meat by-products, and no corn, wheat, or soy. 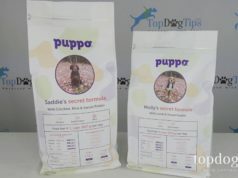 This particular variety of Whole Paws is approved for growth and maintenance and is made with no added sugars or grains. The company isn't very popular among pet owners and is often hard to find in pet stores, but they make one of the best canned dog food brands with a decent price to quality ratio. Price: $57.51/24 cans 5 oz. A grain-free food inspired by raw food, Wellness Trufood Tasty Pairings comes in 5 oz. packs and is available in carrots/salmon/cod, chicken/carrots/duck, chicken/green beans/chicken liver, chicken/pumpkin/beef, green beans/beef/lamb, and pumpkin/lamb/duck varieties. This best canned dog food is made with all-natural ingredients, superfoods, and whole prey meats and contains no artificial colors/flavors/preservatives and no wheat. Price: $23.88/12 cans 12.75 oz. Variety salmon and chicken entrée is a natural food made with no artificial flavors or preservatives, and no corn/wheat/dairy. Formulated for dogs of all life stages, Variety offers a large selection of flavors for rotational feeding and keeping picky dogs interested in their food! Added omega fatty acids keep your dog’s coat, skin, and joints healthy as they grow and help to maintain neurological health. Price: $24.99 + $6.99 shipping/12 cans 13 oz. Only Natural Pet PowerStew grain-free food is made with high-quality meat products and contains no artificial colors/preservatives/fillers and no carrageenan. Available in beef and lamb, chicken and liver, and turkey and duck formulas, this food provides plenty of variety without compromising the quality of ingredients. Made in the USA, Only Pet foods come with a 100% satisfaction guarantee. Price: $49.98/12 cans 13.2 oz. Taste of the Wild is one of the most popular dog food online brands out there, and it's been Amazon best seller for almost a decade now. Taste of the Wild grain free wet dog food is available in wetlands (duck), pacific stream (salmon), high prairie (bison), and Sierra mountain (lamb) formulas. With plenty of variety available, each of these food formulas is complete and balanced and can be fed as a supplementary diet or used as your dog’s main diet. Price: $23.10/12 cans 13 oz. I and Love and You stew canned foods are available in beef, chicken, lamb and turkey varieties. A premium quality ingredient formula – also designed to accommodate dogs with certain allergies – this best canned dog food brand contains no wheat, corn, rice, soy, by-product meals, carrageenan, and no artificial preservatives/colors/flavors. Made in the U.S. with globally sourced ingredients, these foods are supplemented with omegas 3 and 6, and the company was also rated one of the top dog food brands by pet food experts. Price: $33.99/12 cans 12 oz. Newman’s Own grain-free wet dog food is available in chicken, chicken and liver, turkey, turkey and liver, beef, beef and liver, and liver flavor varieties. Newman’s Own wet foods are made with 95% organic ingredients. Suitable for dogs of all life stages, this yet another option of best canned dog food can be purchased in 5.5 oz., 12 z., and 12.7 oz. cans to accommodate dogs of various sizes. Price: $19.38/6 cans 13.2 oz. Instinct Original wet food is available in small breed beef, small breed chicken, beef, chicken, duck, rabbit, lamb, and venison varieties. Available in 3 oz., 5.5 oz., and 13.2 oz. cans this is a great food option for dogs with allergies since it’s made without grains, potato, soy, wheat, corn, or artificial colors and preservatives. Instinct Original wet foods are made in the U.S. from globally sourced ingredients. Price: $48.85/12 cans 12.5 oz. Wellness Grain-Free Core canned food is available in beef/venison/lamb, salmon/whitefish/herring, turkey/chicken liver/turkey liver, and turkey/pork liver/ duck flavor varieties. Made with no grains, soy, corn, wheat gluten, meat by-products, or artificial preservatives/colors/flavors. Made in the USA, this is a food that can be fed to adults and puppies depending on the formula purchased. Price: $53.88/12 cans 13.8 oz. Ideal for dogs with allergies, Addiction canned dog food utilizes unique protein sources. Recipes include turkey/cranberry/apple, brushtail opossum/vegetables, rabbit/blueberry, and unagi/seaweed. This is a food option without grain, fillers, soy, wheat, artificial colors and artificial flavors. This best canned dog food is available in 13 oz. and 13.8 oz. cans depending on the flavor variety selected. Price: $21.60/12 cans 13 oz. Canidae PURE canned dog food is available in a range of flavors including lamb, duck/turkey, lamb/turkey/chicken, salmon/mackerel, and chicken for puppies. Each food is made with limited ingredients and is design for dogs with sensitive stomachs and unique dietary needs. Simmered in broth, this range of foods is made with high-quality proteins and is a great solution for picky eaters. Price: $57.49 + $7.48 shipping/24 cans 5.5 oz. Applaws additive free canned dog food comes in small 5.5 oz. cans and is made with 100% natural ingredients. Low in carbohydrates and made with no additives, this food is made with human grade ingredients. Applaws comes in a range of flavor varieties including chicken/beef liver, chicken/pork, chicken/salmon, chicken/tuna, chicken/vegetables, and chicken. Price: $65.89 + $10.48 shipping/12 cans 12.2 oz. Firstmate grain free canned dog food is a limited ingredient food option that is available in turkey or tuna varieties. Using ingredients that are sustainably sourced this food gets the majority of its protein content from animal protein and a small percentage from potatoes. A good food for maintenance, this best canned dog food is approved for feeding to puppies and adult dogs. Price: $49.08& FREE Shipping/12 cans 13 oz. Earthborn Holistic K95 is a completely natural food that is appropriate for dogs of all breeds and ages. A grain free, gluten free holistic food, K95 is a high protein feeding option with 95% real protein. Although approved for feeding to all dogs, this is a food that should be used as a mixer or a topper for a more balanced feeding option and not fed alone. Price: $52.96/12 cans 13 oz. Bravo! Canine Café is another wet food formula made with 95% meat, making it a high protein food option. Completely free from grains, this is a natural food made with added vitamins and minerals. Available flavors of this canned food include chicken, rabbit, turkey, and beef. This best canned dog food is appropriate for feeding to all breeds and ages and is balanced for feeding alone or as a supplementary food. Price: $27.48/12 cans 13 oz. Purina Beyond natural grain free ground wet food is available in turkey/sweet potato, beef/potato/green been, chicken/carrot/pea, chicken/lamb/spinach, and salmon/sweet potato recipes. A grain-free solution, this food is made with no soy, corn, or wheat, no artificial colors/flavors/preservatives and no by-product meal. This is a food that contains only pronounceable ingredients and nothing you can’t pronounce or that has no application in your dog’s diet. Price: $30.00/12 cans 13.2 oz. Solid Gold Holistic Whole Grain wet food with superfoods is available in 13.2 oz. cans and currently comes in three flavor varieties – Howling at the Stars with Turkey, Hund-N-Flocken with Lamb, StarChaser with chicken. Both the turkey and chicken varieties of this best canned dog food are approved for all life stages and the lamb variety is approved for feeding to adult dogs only. Price: $27.48/12 cans 13.2 oz. Taste of the Wild Grain-Free High Protein wet food is available in a venison/bison, salmon, lamb, wild boar, and duck varieties. An all-natural food, this is a grain free food with no corn, wheat, filler ingredients, and no artificial flavors/colors/preservatives. Made in the USA, this food variety contains prebiotics and superfoods for optimal health. Price: $32.99/12 cans 12.5 oz. Wellness Simple Natural wet canned LID food is available in duck/oatmeal, lamb/oatmeal, turkey/potato, and whitefish/potato recipes. A limited ingredient food, this is a great choice for dogs with sensitive digestion or allergies and is made with only premium natural ingredients. Made with single source proteins, this is a food that does not contain gluten, wheat, fillers, or artificial additives. Price: $35.88/12 cans 13.2 oz. Castor and Pollux Natural Ultramix is available in six recipe options – whole chicken thighs, venison, minced chicken/bacon, beef tripe/chicken, beef/vegetable, and all beef sausage links. Made in the USA, these recipes contain no corn, wheat, soy, or artificial colors/flavors/preservatives. High-quality proteins and added omega fatty acids provide your dog optimal nutrition while ongoing testing ensures quality control. Price: $42.02/12 cans 13.2 oz. Halo Spot’s Stew for dogs is available in salmon, chicken, lamb, and beef formulas and comes in 5.5 oz., 13.2 oz., and 22 oz. cans. This food is made with whole meat products and non-GMO vegetables and is packaged in BPA free cans. Halo makes this best canned dog food with no artificial colors, flavors, or preservatives and no rendered meat meals. Price: $31.08 + $6.99 shipping/12 cans 12.5 oz. A limited ingredient food, this turkey and potato based wet dog food is grain free and contains just five ingredients to accommodate dogs with sensitive digestion. This is also a food recommended for dogs with dairy, beef, and chicken allergies. All natural ingredients offer quality nutrition while this premium canned food contains no by-product meal, soy, or artificial colors or preservatives. Price: $44.28/12 cans 13.2 oz. Petcurean Go Sensitivity and Shine grain free duck pate is a grain free pate textured food developed for dogs in all life stages. Ideal for dogs with allergies and sensitivities, this canned food is made with premium proteins and contains prebiotics for digestive health. Gluten free, this best canned dog food contains no by-product meals, growth hormones, artificial preservatives, beef, wheat, corn, or soy. Price: $39.89/12 cans 13 oz. Zignature LID canned dog food is available in a range of unique protein formulas including lamb, duck, kangaroo, salmon, turkey, trout, whitefish, and multi-protein formula for sensitive dogs. Made with no carrageenan, guar gum, corn, wheat, soy, glutens, or grains, this is a fiber-rich, low glycemic diet ideal for dogs of all ages and breeds. Price: $30.21 / 12 cans 13 oz. Natural Balance LID wet foods are one of the most well known limited ingredient options on the market. Made with no artificial colors, flavors, or preservatives, this best canned dog food comes in a range of recipes including – chicken and sweet potato, fish and sweet potato, duck and potato, buffalo and sweet potato, lamb and brown rice, sweet potato and venison, and wild boar and brown rice. Price: $56.16/12 cans 13.2 oz. Nature’s Variety Instinct LID grain free recipe wet food is a grain free, gluten free food made with a single animal protein. Made with highly digestible ingredients, this food is also free of potato, dairy, eggs, chicken, beef, and fish. Formulas include lamb, duck, and rabbit recipes. This is a feeding option that is approved for all life stages and breeds. Price: $42.95/12 cans 14 oz. Weruva grain free canned wet dog food is available in sixteen different flavor varieties providing feeding options for dogs with all dietary needs. This is a low fat, low carb, grain free, gluten free, GMO-free, MSG free, carrageenan free food that is made in a human food facility. They are one of the new pet food companies in the industry, and have been becoming very popular among pet owners due to attention to only high quality ingredients and manufacturing process, including this listed best canned dog food formula. Price: $64.80/12 cans 13.75 oz. Ziwi Peak canned dog cuisine is a premium wet dog food option available in six recipes – beef, lamb, mackerel and lamb, rabbit and lamb, tripe and lamb, and venison. This best canned dog food is 100% free from added hormones, grains, fillers, potatoes, rice, antibiotics, guar gum, carrageenan and GMO’s and is packaged in BPA free packaging. Price: $27.50 + $9.42 shipping/24 cans 5.5 oz. Health Extension lamb entrée is a limited ingredient canned dog food available in smaller cans ideal for small dogs or supplementary feeding. Made from lamb with no growth hormones or steroids, this wet dog food also contains no by-products, rendered animal fats, gluten, corn, artificial preservatives, wheat, BHT, ethoxyquin, added sugar, or artificial colors/flavors/preservatives. Price: $76.56/24 cans 6 oz. K9 Natural canned dog food is available in beef, chicken, and lamb formulas. Made without grains, GMO ingredients, gluten, corn, dairy, soy, rice, cereals, potato, or gelling agents or fillers. A higher protein formula food, K9 is made with 90% meat, bone, and organ products and is a completely balanced formula for healthy feeding on a daily basis. Price: $67.74/12 cans 13 oz. Koha can venison kiwi dog food is a unique limited ingredient brand that is made with no added gluten, grain, or potato. A high protein formula, Koha wet dog food is made with 90% protein and is a complete and balanced food approved for dogs of all ages. This food also contains ingredients specifically added for digestive support. Koha company is another one of those that are difficult to find, whether in pet stores or online, and not all of their foods are of great quality, but this particular best canned dog food formula deserves a mention as many pet owners had great success with the recipe. Price: $17.94 + $6.99 shipping/6 containers 3.5 oz. Applaws LID layer wet dog foods come in 3.5 oz. serving dishes and are made with very limited ingredients to make them highly digestible. Containing all natural ingredients, this is a food designed for supplemental feeding only and should be combined with a LID dry food or another balanced diet. A unique layered design gives this food an interesting look to go with its unique texture and flavor. Price: $26.88/12 cans 12.5 oz. NUTRO LID adult wet dog food is available in two recipe options – fish and lamb. A grain-free food, this is an option formulated specifically for dogs with allergies or food sensitivities. Made with just a handful of ingredients, this last of the limited ingredient best canned dog food brands contains no chicken by-product meals, soy, or artificial flavors or preservatives. NUTRO company itself has been rapidly growing with many pet owners becoming huge fans of their products, and we even had some of their representatives on the podcast to talk about their process of making pet food. Price: $30.48/24 cans 3.5 oz. Crave high protein grain free adult wet dog food has a pate texture and is available in five flavor options – beef, chicken, chicken and beef, turkey, and turkey and lamb. Cans are available in both 3.5 oz. and 12.5 oz. and both recipes are made with no chicken by-product meal, corn, wheat, or soy protein, artificial colors or preservatives. Solid Gold Holistic grain free food with superfoods is mentioned above, however, their chicken/tapioca/quinoa and lamb/sweet potato/pea formulas are also a great choice for dogs with high protein needs. This best canned dog food option contains no corn, wheat, or soy, and is approved for dogs of all sizes and life stages. The term “superfoods” is more of a marketing gimmick, but the company is well-known for adding a larger number of ingredients with vitamins and minerals, hence the mention of this recipe on the best canned dog food brands list. Price: $34.68/12 cans 12.5 oz. Another option from the above mentioned NUTRO company, this high protein best canned dog food recipe is on the very expensive side (as most high protein dog foods are), but worth the purchase if you can afford it. NUTRO Wild Frontier wet dog food comes in both 3.5 oz. and 12.5 oz. cans. Recipes include beef, chicken, turkey, and lamb and are formulated using a full prey recipe. Nutrient-rich, this is a 92% protein-based food that contains no corn, soy, or chicken byproduct. This food is formulated for adult maintenance feeding. Price: $34.97/12 cans 13.2 oz. Dave’s Pet Food 95% premium meats canned wet food is an all natural food with high protein content. This best canned dog food contains no wheat, corn, gluten, or soy and no artificial flavors or colors. Holistically formulated, this food is approved for feeding for all life stages and is made in the USA. 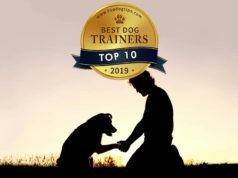 The company is rarely mentioned among pet owners mostly because they're small and usually sell in local pet stores without any massive advertisement campaigns, but some of their products have been very well-received by a number of pet owners. Price: $33.94/12 cans 13 oz. Nutrisca Chicken and Chickpea Stew recipe is a premium grain-free formula made with natural ingredients and added vitamins and chelated minerals. A low glycemic index aligns this food with a more natural dietary approach and high levels of antioxidants support the immune system. High in protein, this recipe includes no grains, potatoes, or tapioca starch. Price: $64.99 / 24 cans 6 oz. Wellness and their CORE formula are arguably one of the most well-reviewed pet foods out of the most popular brands in the USA, and this best canned dog food recipe is worth a mention on the list due to its positive reviews from dog owners. In particular, Wellness Core 95% adult dog food is specifically designed for dogs with high protein needs. A 100% natural food, this is a gluten free, grain free option that can be served as a complete balanced meal or as an additive to a more traditional meal to increase protein levels. Price: $58.99/12 cans 12.5 oz. Lotus grain free turkey stew can dog food is formulated for feeding to all breeds at all life stages. It is made with high-quality protein and supplemented with mussels to provide healthy levels of glucosamine and chondroitin. Made in the USA (with some ingredients sourced elsewhere), this wet dog food also contains added omega fatty acids for healthy skin and coat. The popularity of this brand is around average, with some of their products receiving more positive feedback from pet owners than others. However, this best canned dog food recipe has been often praised by dog owners in a number of wet dog food reviews online and dog forums. Price: $46.99/12 cans 13 oz. Approved for feeding to all life stages, this is a natural food made with added vitamins and minerals. Both the chicken and turkey used in this recipe are completely organic, and the formula also includes added fatty acids and antioxidants for overall health. Easily digestible, this is one of the few organic wet dog foods certified by the USDA to be organic. Because of the costs involved to manufacture organic canned dog food and source all the organic ingredients, this best canned dog food brand is one of the most expensive on this list. Price: $41.88/12 cans 9.87 oz. Almo Nature Legend Beef, Pea, and Potato canned dog food is made with 100% all natural ingredients and is formulated for optimal digestion. Protein-rich, this best canned dog food is made with optimal cuts of beef that come from free-range cattle. The beef used in this formula is from Uruguay and the food itself is also a product of Uruguay. An easy to digest food, this is intended for supplementary feeding and should not be relied on for complete nutrition. Price: $18.85/12 cans 13 oz. Hill's Science is one of the most popular vet recommended dog food brands, but it often receives mixed reviews from pet owners – some love their products while others ignore them. This Hill's Science Diet wet dog food for adults aged 7+ is a high protein dog food that was developed to promote ideal body weight and is made to be easily digestible. 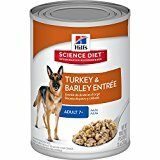 This last best canned dog food option is available in three recipes – beef, chicken, and turkey and each food comes with 100% money back guarantee to ensure your satisfaction.